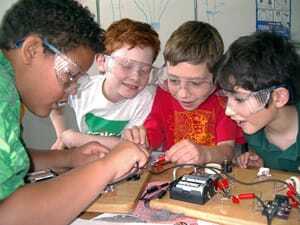 ​Why Do All Students Need to Learn Science? ​I believe that it is important for all students to learn science, not only in the sense of scientific content but also how to think and act like a scientist. We live in a globally connected society where individuals have constant access to information and technology. For this reason, students need to develop the ability to determine whether information is factual or not. Supporting students in critical thinking allows science to be a great equalizer by building on student interest and active engagement that is both hands-on and minds-on. As students act and think like scientists to figure out phenomena or solve problems through engagement in the practices, they are incorporating science ideas and concepts into their personal way of looking at the world. This will help students as they mature and begin to deal with both personal and societal issues that will require them to make informed decisions based on their understanding of science and technology. How is this Reflected in the Classroom Curriculum? As the student population in classrooms becomes more diverse, the approaches to teaching has to become more diverse as well. In order for this to occur in my classroom, there has been a transition from the more traditional lecture format of science to hands-on learning that is driven by the students. This includes the integration of activities that range from computer simulations, labs, active learning experiences, and the use of technology in the classroom. By covering a scientific topic in many different formats, students with different learning styles are all able to interact with the material in a manner that works for them. In some cases, all students will participate in each of the different activities while, in other instances, the students choose which way they would like to learn the information being covered. This allows all students to demonstrate their undertanding of all the standards even though they may get to that deep level of understanding in a different way. This sense of choice also allow students to take ownership in their own learning - an important skill that can carry over to situations in their personal lives as well. ​​For more information, feel free to check out Appendix D, which was published as a part of the Next Generation Science Standards.